After some fussing around, I finally fixed the duplicate packet problem on my wireless router. This fixed my annoying “echo problem” with Second Life, where everything I did was happening twice (chat would echo, etc.) due to each UDP packet being sent/received twice. I’m reading the clothing tutorials and will be making myself a wardrobe pretty soon, and look forward to learning LSL to do some scripting, too. 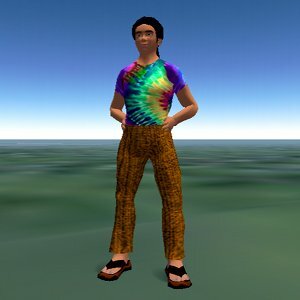 If you’re a SL citizen, feel free to look me up. it’s good to see that even in virtual worlds, you’re still wearing sandals. but your shirt isn’t tye-dyed (tye-died? tie-died??) enough.